A great combo of Chicken Carbonara that you can get at a restaurant and the crispy crust you get when you have baked macaroni and cheese. I get Chicken Carbonara everytime I go to Olive Garden, they have it with just chicken and also chicken and shrimp. To me its sauce is lighter than a Chicken Alfredo that has a strong garlic taste and heavy sauce. It doesn't hurt that it comes with bacon or pancetta (an Italian bacon). The only different between bacon and pancetta is how they prepare it. Pancetta is rolled. They are both delicious. Make this the day before so when you get home you just need to pop it in the oven and have dinner in minutes. Note: Bacon grease give the sauce a little more flavor and helps the sauce go up in temperature so the eggs won't scrambled when the hot chicken and bacon are added. 1. )Preheat oven to 350 degrees. Place eggs out to bring up room temperature. It really depends on the temperature of your house on how long it will take to do so. 2. )Cut bacon into 2 inch piece and sauté for 7 minutes or until crispy. 3. )Once bacon is crispy, transfer to a paper towel and let cool. Sprinkle a little pepper on the chicken and place chicken pepper side down in the bacon grease and cook for 5 minutes on first side then flip out for another 5 minutes. 4. )After the chicken has cooked 5 minutes on each side continue to cook for another 10 to 15 minutes or until nicely brown on each side and fully cooked in the middle. 5. )While the chicken continues to cook, combine parmesan cheese, granulated onion, granulated garlic, dried parsley, last teaspoon of black pepper, 2 cups of milk and bacon grease. Whisk together and set aside. 6. )Check chicken for doneness. Set aside and let it cool slightly for easier handling. Chop chicken up once slightly cooled. 7.) Add chicken and bacon to the cream sauce then fold in the pasta. 9.) Baked for 35 minutes covered. Removed parchment and aluminum then back for another 5 to 10 minutes or until golden brown on top. 10.) Let it cool for 5 minutes before servings. I have seen lots of carBomar recipes and tried quite a few because honestly, I LOVE it. But what I like about yours which I've never seen before is how very, very chunky it is! I love how much chicken and bacon you have in it! ! It is 10:30 pm right now and my stomach just grumbled when I saw this. I even tried to zoom in on the photos haha. I didn't know about chicken carbonara before. It looks yummy. Thanks for sharing it. This looks so yummy. With fall right around the corner I am looking for fun new casseroles and soups to make for dinner. This is definitely making the dinner menu. This looks delicious and easy! I'm definitely going to need to try this! oh my god this looks so delicious i am so adding it to my recipe book! 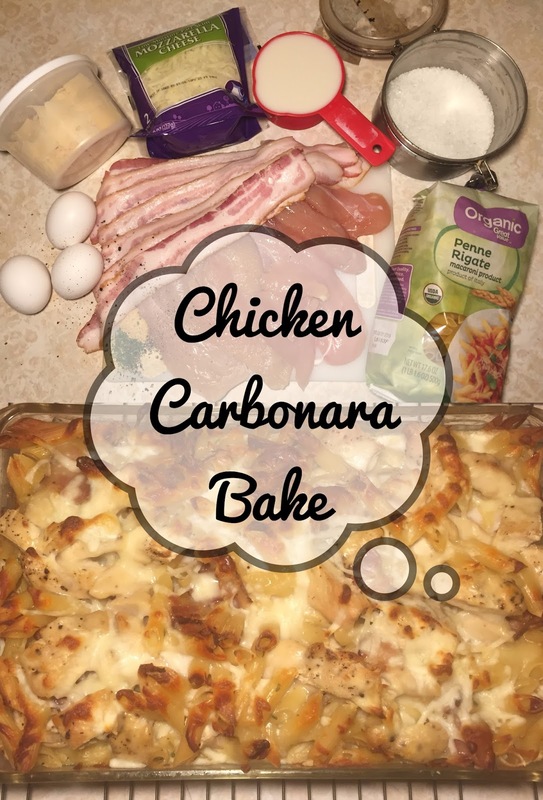 Chicken Carbonara, I so love chicken and I would will trying to make this one but I guess I wont put a lot of bacon, cheese are looking good though, thanks for sharing this. This looks so tempting and delicious. I would love to try this recipe in our family gathering. Surely they will definitely like this chicken carbonara bake. Just tried the recipe and I loveddd itttt. I'll definitely have to share this recipe with my mom, this looks so delicious! Oh my! This looks really delicious! My family loves carbonara and i will make this for them. Looks DELICIOUS! I'm not a big fan of cooking but I'm a big fan of eating yummy food. I'll have to try this. Thanks!!! Love how you tried to recreate this dish and make it your own at the same time. Baking it def sounds like a 'healthier' option! I love to have easy things you can make so that you do not have to cook for the week. Sometimes you just need food and you can not wait for food to be made. This sounds really yummy and I love how simple it is! I agree with you - I like Carbonana better than Alfredo because it isn't as thick/rich. Great recipe! Yummy. Love that ou included pictures. I swear every cookbook should do that for aus novice cooks. Delicious recipe, gonna try this weekend for friends. we love carbonara in my household but sometimes we're just lazy and use the sauce that comes from a bottle! got to try your recipe! This looks yummy! Great idea for a comfort dish! Such an easy to make recipe. I will give it a try. Thanks! This looks delicious! I would definitely make it with pancetta because it's my favorite. This sounds very good and perfect for colder months. I am curious, can the bacon be subbed for turkey bacon. I know you said the grease gives it flavor so I would want to keep as much flavor as possible. Yes, of course you can use turkey bacon. Fry it like regular bacon to give off the grease. I am a huge pasta girl. this looks like a tasty and easy recipe to follow. Looks like a fantastic comfort dish! I love to see all these Italian style American dishes, yummy! The dish look yummy. But you know what... the website design of your blog is even more amazing. How did you do it? I love chicken carbonara, and it's one of my go-to choices at Olive Garden, too! This looks delicious, and I am definitely going to try it! This is a recipe that the kids will absolutely love! I like that it's not difficult to put together. I'm totally going to make this for dinner soon. This looks yummy! My husband loves anything with bacon. Carbonara is literally the only main dish I could cook lol. Turning it into a bake sounds delish! This is a perfect weeknight meal. I devour all types of pasta, so this looks like complete perfection! And I love anything that you can make ahead to heat up after a workday. Can't wait to try this! Carbonaara is the best I would love to try this! Great idea turning it into a bake -- can't wait to try soon! the picture looks yummy. This recipe with a twist will surely be liked by kids and kids at heart. Pasta bakes are the ultimate comfort food and this one looks so yummy. Perfect for a cold winter night. Its great that this is so easy to make. Plenty for leftovers too. It does look absolutely delicious. I love the tender chicken and the delicious cheese sauce that is created here. And a great crust created as well. The dish looks amazing!! I am not much of a cook but passing this to my mother and I'm gonna enjoy it ;) Great recipe. Great recipe, loved the step by step directions and pictures as well! Thank you! This looks really good and would probably leave me lots of left overs for the work week! All my favorite things to eat all rolled up into one dish! I'm definitely going to try this recipe. It sounds awesome. This looks absolutely amazing and so simple to make. I don't think I've ever had chicken cabonara...only seafood. Thanks for this recicpe. Hmmmm this looks so good and the crispy crust is the best part! Yummy!